Historic design in sousaphones, the C.G. Conn 20K originated from the concepts of John Philip Sousa in the early 1900's. 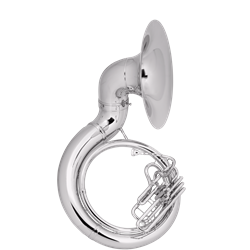 This large bore .734" with a 26" bell sousaphone offers great ergonomics and durability. Improved bracing along with short action, offset pistons offers great versatility for any sousaphone section. Silver plated. TECH SPECS Key of BBb All Brass .734" Bore 26" Bell Exclusive Offset Short-Action Pistons Clear Lacquer Silver-Plated Heavy Duty Bracing FREE SHIPPING with your purchase today!